Featured Thread: First Three Dungeons? For many Zelda games there has been the same classic formula: Three simple dungeons, get the master sword, a plot twist, and then following up with several more dungeons. The first game to implement this was A Link to the Past where Link got the three pendents, got the master sword, and soon after journeyed into the Dark World. 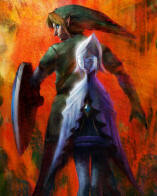 A similar format was used in Ocarina of Time where Link went through a Forest, Fire, and then Water dungeon as a child before getting the master sword and journeying 7 years in time. The Wind Waker saw a similar format of needing to get three collectibles and then the master sword. Twilight Princess was nearly identical to that of Ocarina of Time in that the first three dungeons were Forest, Fire, and Water based, then Link got the Master Sword along with a plot twist that led to more dungeon exploring. That’s four titles that have used the same basic three dungeon system, master sword, plot twist, and then more dungeons. For better or for worse, these four titles are some of the most popular Zelda titles in the series to date. Moving forward though, do you think Nintendo should stick to this with the upcoming Legend of Zelda title for the Nintendo Wii? Do you think this formula has grown too predictable and unoriginal in the Zelda series? Is the three dungeon system fine, but just drop the Master Sword and things will be alright, which is something more inline with Phantom Hourglass? Our resident forum member Raven made a thread discussing the First Three Dungeons over at our Zelda Wii Forum. Let us know what you think by posting in the forum thread or posting in the comments below.